Cheap dry cat food has sparked an obesity epidemic among cats in countries where high-carbohydrate pet foods are readily available. Obesity presents serious health risks to cats, but a weight loss program will only work if the changes are maintained for the rest of the cat’s life. Crash diets don’t work with cats any better than they work with people. The cat simply experiences feelings of starvation and either fails to lose much weight or loses weight rapidly and then puts it back on when the diet is over. Permanent lifestyle changes are required to maintain a healthy weight for life. The latter factor is probably the most common cause of obesity in cats. A diet of cheap, dry kibble is not really a bargain, as it can have serious health consequences in the long run. Is the cat relatively sedentary? Does he have trouble running, jumping, and climbing? Do the sides of his body form straight lines when viewed from above, or does he bulge out at the sides? When viewed from the side, does his belly form a straight line that runs parallel to the floor, or does it curve downward? Can you feel his ribs with your fingers, or is there a lot of fat overlying them? His ribs shouldn’t be visible, but you should be able to feel them. A veterinary consultation is necessary before embarking on any weight loss program because health issues must be taken into account when determining the best and safest approach. Existing kidney and heart disease may also be accelerated by excess weight. Don’t free feed – provide a measured quantity of food at each meal. Have one adult or responsible older child take charge of feeding all pets, and don’t allow other members of the household to offer food between meals. In multicat households, feed each cat in a separate room with the door closed to prevent food stealing. Offer calorie-free treats such as catnip, or provide attention and affection in place of extra food and treats. Play with the cat daily so that he can make use of his hunting skills. Feed the cat in a remote area of the house, making it more work to take a trip to the food bowl and thus forcing the cat to expend more energy to get his food. Weight reduction programs require veterinary supervision. Be sure to take your cat in for regular progress assessments and health checks. Cats that need to lose weight should be fed a high-protein diet. While low-fat, high-fiber diets are often recommended for fat cats, not all cats lose weight on these diets, and many develop dry, flaky coats, and in some cases, more serious health problems. Fiber suppresses appetite to some degree in people, but it doesn’t have this effect on cats, because while people are omnivores, cats are obligate carnivores. This means that cats on high-fiber diets eat more in an attempt to satisfy their protein requirements, or suffer feelings of starvation if fed controlled portions. The best way to promote healthy weight loss for cats is by feeding high-protein canned wet food. Cats feel full without eating as much because their protein requirements are met, and the water content of the food means that the same portion contains fewer calories. Look for foods for which meat (not wheat, rice, corn, or by-products) is the first ingredient listed on the label. See High Protein Diets for Cats for information on how to calculate the protein content in cat foods and choose the best protein sources for optimum health. Barchas, Eric, DVM. (2009). 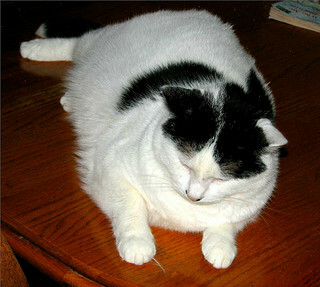 “Obesity n Cats.” DrBarchas.com. Wynn, Susan, DVM. (2003). “Weight Problems in pet Animals—Do Diet Foods Work?” AltVetMed.com.